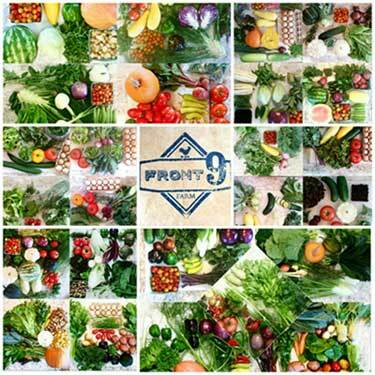 Front 9 Farm specializes in producing over 100 types of fruits and vegetables which are packaged into weekly CSA (community supported agriculture) shares. These shares are sold to our local community members and within Medina and Cuyahoga counties. The shares are distributed weekly at two pickup locations: the Medina Farmers’ Market on Saturdays from 9am-1pm, and Madison Park in Lakewood (west Cleveland) on Thursday evenings from 5pm-7pm. The CSA program begins in mid-May and runs 26 weeks through the beginning of November. Each week the shares contain 8-10 different produce items as well as pasture-raised chicken and eggs, which are included intermittently for a total of 6 broiler hens and 6 dozen eggs throughout the 26-week season. The shares are carefully curated to cycle through over 100 unique plant species (produce items) throughout the season. All fruits, vegetables, chicken, and eggs are grown on our 10-acre farm using organic principles, sustainable practices, and precise management. We’re confident we can build off of our first CSA season (in 2016) to this year produce higher quality fruits and vegetables, more polished CSA packages, with more desirable proportions of produce items, and a greater diversity of produce offerings. Our passion is producing high-quality, nutritionally-dense food for our community, so that our community members can lead rich and healthy lives.